Kids are very picky with what they eat, so it's hard to think of ways to cook fish. Well, you don't have to stress out this week. Here's a fish fillet recipe that's easy to cook yet a sure blockbuster among your brood. This quick and easy recipe is a no-brainer even if your hands are full. 1. In a bowl, mix bread crumbs, lemon zest, parmesan cheese and parsley together. 2. In another bowl, beat the eggs. Set aside. 3. In a separate plate, add salt and pepper to the flour to taste. 4. Take one fish at a time, and coat with flour. Then, dip in the eggs. Coat with bread crumbs mixture. 5. Add oil to your preheated Chefs' Classics Camomile Frypan. 6. 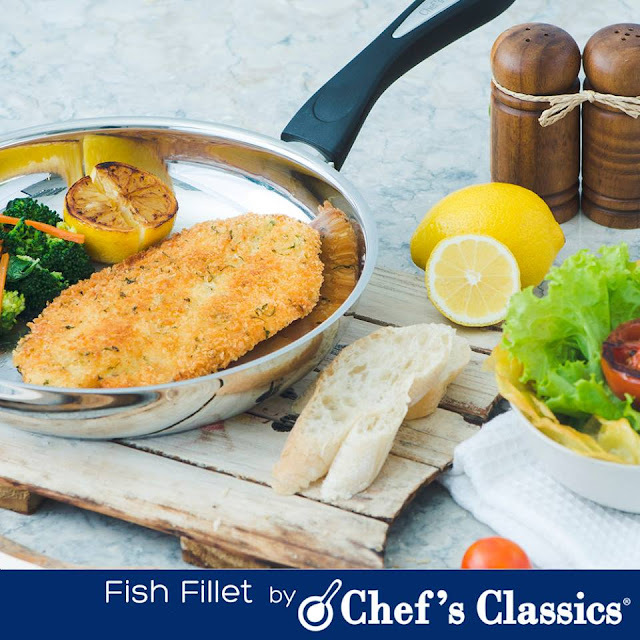 Fry breaded fish to golden brown perfection.